I can't deal with human emotions on an empty stomach. It makes me nauseous. Permalink: I can't deal with human emotions on an empty stomach. It makes me nauseous. Therapists. They really don't know anything, do they? Permalink: Therapists. They really don't know anything, do they? No phones on campus. Sends a message that our arms aren't available to our children. Permalink: No phones on campus. Sends a message that our arms aren't available to our children. Sorry, ladies, but it's hard for me to enjoy a triple-Decker with my mother's hands all over it. Chloe: I'm going to tie a bell around your neck at some point. Lucifer: Oh, that sounds like a fun bit of foreplay. Permalink: Oh, that sounds like a fun bit of foreplay. Fancy pants rich kids are vipers and Trixie will slash them with her words. And I will teach her the knives. 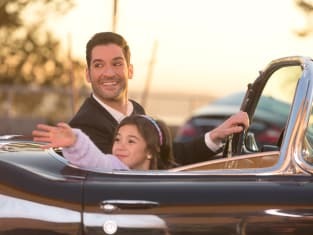 Lucifer Photo Preview: Lucifer and Trixie Take a Ride!